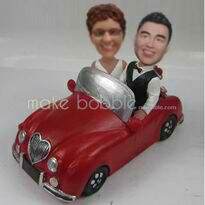 Personalized bobbleheads with red car - a love more than a gift! Long after the excitement of the wedding day has faded, a couples Bobblehead will provide a visible reminder of the lifelong commitment that the couple has made. Just like an Eternity ring, a couples Bobblehead will be a clear statement of continuing love and devotion.